A definite advantage of using a web application (Figure 4) is that it is independent of any platform. A web app operates equally well on a desktop computer and a smartphone. Figure 4: Setting the wake up time and start times via the web GUI is easy in a browser. Basically, the little Rasp Pi based motivation assistant will already function in this constellation. You only have to tell it what it should do. If you used the same codes as I, then everything should work fine; otherwise, you can change the values in the alarm.php file (Listing 2). The script first reads the variables for the time of day you want your motivation assistant to start working. Then it creates a cron job that executes commands for the operation of the wireless communication outlets. You also need to modify the switch.php file (Listing 3) when using other codes. The file shuts all wireless communication outlets off again when you press the Turn off all button in the web GUI. To make the application accessible, you should copy the contents of the entire homeautomation folder from the Raspberry Pi Geek FTP server  onto the web server in the var/www/ directory. Additionally, you should make sure that the www-data user has the rights necessary to execute the commands via PHP. As long as the Raspberry Pi is only accessible in the home network and you have no significant security concerns, you can set the rights for this as shown in Listing 4. Afterward, you should start the web application on the client in the browser under <Pi-IP>/homeautomation/index.php. 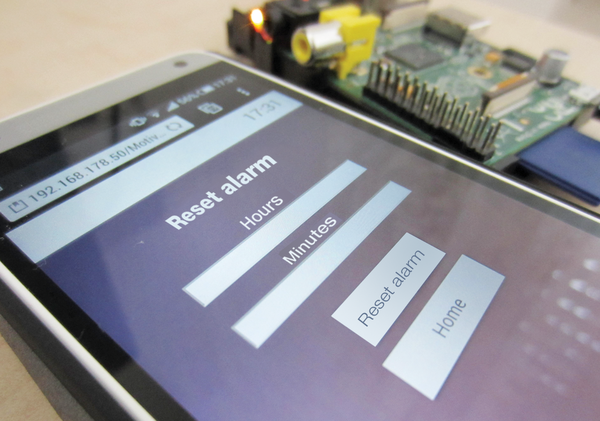 Help a bed-ridden housemate with a call button that lets you know when they need help.